Hello Delta Sierra Club Alfisti! 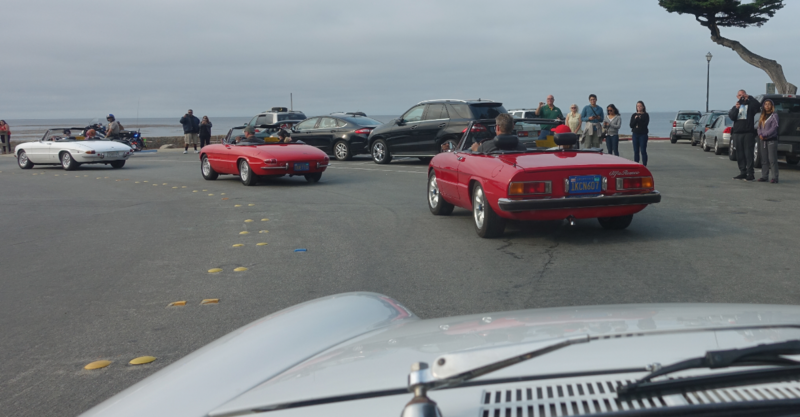 1.CONCORSO ITALIANO is on Saturday, August 25th at the Black Horse Golf Course. Once again Alfa Romeo is a major event sponsor, and for 2017 the Alfa Romeo GTV, the newly launched Giulia, and the Alfa 4C will be featured. If you haven’t yet registered your Alfa to display and attend Concorso Italiano 2017, do so right away at www.concorso.com as registration gets a lot more expensive the closer you get to the event. 4.LAUREL INN. Sign up NOW to avoid missing out on a room. Hotel rooms in Monterey book up a year in advance, and there will be a high demand now, so do not miss this opportunity to get a room this year. To allow people more flexibility, we have arranged 2, 3, and 4-day stays at the Laurel Inn as part of our group reservation. This way, members can do a full day of Monterey events on Sunday, and make a relaxed trip home on Monday. This can help avoid Sunday afternoon traffic home when many attendees usually depart. See the attached Monterey/Hotel information and order blank for details on reserving your room. 6.AROSC GROUP DINNER on Thursday night, August 17th. As in past years, we have been invited by our friends from the Alfa Romeo Owners of Southern California (AROSC) to join their group dinner in Monterey at Ambrosia India Bistro, 565 Abrego Street. $25 per person (includes tax & tip) gets you a tasty Italian and Indian buffet dinner. Beverages are available for purchase. Please RSVP ahead of time to Evelyn Silverman at Normanev@msn.com. 7.CARMEL DRIVE THROUGH. Don’t forget about Thursday morning’s Tour d’Elegance in Carmel on Ocean Avenue. A lot of the Pebble Beach Concours cars participate in this, a 70+ mile tour of the Carmel-Monterey area which pauses on Ocean Avenue in Carmel for lunch from about 11am to 2:00 pm. Spectators can wander among the 100 or so vintage cars that are parked in a four lane, four-block area and it is FREE! Google “Pebble Beach Tour d’Elegance” for more information. If you want to avoid the crowds, download the route map of the Tour and drive out on the route to see them go by. No crowds and you get to see, hear and smell these fabulous cars.